August 13, 2014, 11:35 AM · Hersheypark – We now know what Hersheypark has planned for next year: Laff Trakk. Called by the park "the first indoor, spinning, glow-coaster in the United States," Laff Trakk will open in May 2015. A Maurer-Sohne coaster with seven, four-seat, 360-degree, free-spinning cars, Laff Trakk will take riders through an old-fashioned fun house at up to 40 miles per hour. And thank you to Hersheypark for dispensing with the bullcrap teaser campaign and just giving it to us straight up. This has been noted and will result in many months of goodwill from this writer. Silver Dollar City – The Branson, Mo. 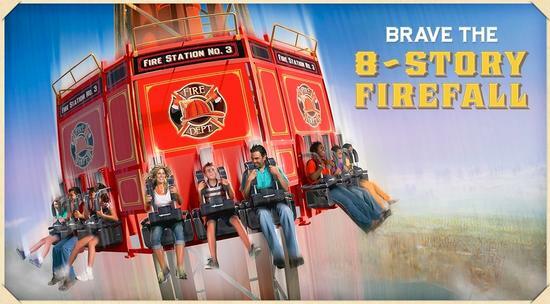 park has announced its addition for 2015 — Fireman's Landing, a new land featuring an eight-story drop ride, FireFall, as well as a variety of flat rides and children's play areas. So it's the theme from Dollywood's new Firechaser Express, but not the coaster? Busch Gardens Tampa – Falcon’s Fury is testing (again). Should we be concerned that the test dummy is missing its legs? S&S Worldwide – We have a mystery in the works. Someone in North America is going to get the first 4D Free Spin coaster in 2015…we just don’t know who just yet. Cedar Point – Mantis is scheduled to go under the knife. As part of its facelift, it will be turned into a floorless coaster, receive a new coat of paint, and be given a new name. Since they still have an outstanding bet with a certain basketball star, can anyone guess what the new name is going to be? Universal Studios Florida – Apparently the message in the phone booth in Diagon Alley (dial M-A-G-I-C) could be a hint about the next expansion of Harry Potter. Although this should be considered a wild rumor at this point, we are hearing that the next Potter expansion would take over the Fear Factor building. But before then, we have heard that Twister could be coming down for something new with the smart money right now on something from Fast & Furious or Hunger Games. It is interesting to note that whoever gets in bed with the Hunger Games franchise will also have the inside track to get Twilight, Expendables, Divergent, Saw, Texas Chainsaw, as well as other Lions Gate franchises that have yet to make an appearance in theme parks. Star Wars @ Disney Parks – Is anyone else getting irritated with Disney saying that they are planning on expanding Star Wars in their theme parks and then doing nothing about it? Well, rumor has it that JJ Abrams is not letting anyone in on the new places, characters, and plot elements of the new movies, so Imagineering is going to be waiting until they get the information they need to start the creative processes. It seems like they should step away from Star Wars for a little bit and get cracking on an attraction for Guardians of the Galaxy instead. I have no idea what Disney is doing twiddling their thumbs, but let me explain it for them: Franchise = Theme Park Attraction. If Frozen is going to be a franchise, get to work on the attraction. If Guardians of the Galaxy is a franchise, get to work on the attraction. If Avengers is a franchise…am I a broken record here? And do yourself a favor…get rid of the top heavy orientation of Imagineering this will help save a bunch of budget and keep you from spending $68 million on a $200,000 spinny ride. Six Flags New England – I personally like the jumps. Do you think we might get to keep those? Roller Coaster Tycoon World – This should make a bunch of people happy today. I know 10 years is a long time to wait to get the latest version of your favorite game, but based what we can see in the below video, it looks pretty good. According to IGN, and responding to the irritation of fans who have played (or refused to play) the mobile version of the game, this will be a return to the Roller Coaster Tycoon 3 style of gameplay with a multiplayer option. There will be no timed constructions or micro-purchases…that was only for the mobile gameplay model. A hobby that you can make money at is never a job. Now Hiring – Cedar Point is currently hiring for “Screamsters” which I would assume are unionized Halloween actors. August 13, 2014 at 11:58 AM · Am I the only person who thinks a theme park attraction based on movies where kids kill other kids is not a good idea? August 13, 2014 at 12:02 PM · We were at Universal Studios a couple of weeks ago and my wife was like "They could take the sharks from the jaws ride, add them to the twister show and re-theme it to Sharknado!" I thought it was brilliant. Especially if they do it for Halloween Horror Nights and have scare actors dressed as sharks coming after you in the street in front of the show. August 13, 2014 at 12:12 PM · Disney can't attractionize Avengers. Those characters are licensed for Universal parks. August 13, 2014 at 12:40 PM · Fact Check: Lions Gate has distributed the rights to the Saw franchise to Merlin Entertainments thus their IP has made it into a theme park. Saw: The Ride is located at Thrope Park. What the terms of those rights are and if they exist outside the U.K. and/or Europe I'm not sure of. August 13, 2014 at 1:12 PM · To the anonymous comment: Disney can create attractions based on The Avengers at any park outside Florida and Japan. There's an Iron Man ride already under development for Hong Kong Disneyland. BTW, I approved that comment mostly so I could share that someone has verbed attraction into "attractionize." August 13, 2014 at 1:11 PM · I can't figure out why Falcon's Fury is opening after the Summer peak season... they should have timed it better, IMO. August 13, 2014 at 2:22 PM · "Is anyone else getting irritated with Disney saying that they are planning on expanding Star Wars in their theme parks and then doing nothing about it?" This is a timing issue. They already announced Avatar way before Star Wars. Let them get one thing done at a time. Disney hinted at Star Wars plenty of times. They are doing things in the background. You just don't know. Anyways, I do think Disney will continue their practice of completing projects in phases. They have plenty of material for the first two trilogies. They don't need to do anything for the last trilogy for at least 10 years. Let them drag it out. August 13, 2014 at 7:17 PM · Its possible that Disney could announce that Frozen is coming to the parks in terms of a new ride with their Frozen television special on September 2. It would be a month before the rumored Frozen overlay for Maelstrom. August 14, 2014 at 7:38 AM · Geez, Silver Dollar City- does the world really need another drop tower ride that takes 3 months to build and another year and a half to test before it is ready to work only part time for guests? August 14, 2014 at 9:11 AM · Saw is in Thrope Park is it not? August 16, 2014 at 6:48 AM · In response to the question: "Geez, Silver Dollar City- does the world really need another drop tower ride that takes 3 months to build and another year and a half to test before it is ready to work only part time for guests?" No. However, the drop ride SDC is installing is moving from their now defunct Celebration City park nearby, not being built new. For good or for ill, this lame space shot attraction will be up and running in Spring 2015, without fail. Additionally, there is hope that SDC will add some sort of coaster like Dollywood's Firechaser Express to this rethemed area in 2016...but I am not holding my breath. As for Mantis at CP, I did not think it was a bad ride. In fact, I enjoyed it. You just have to know the "right way" to stand and everything will be fine (besides, I always wanted to sing soprano). Still, making it a floor-less coaster is probably a good idea. Wonder if they can beef up the speed a little as part of the revamp?